The independent variable and dependent variable are examined in any experiment using the scientific method, so it's important to know what they are and how to use them. Here are the definitions for independent and dependent variables, examples of each variable, and the explanation for how to graph them. The independent variable is the condition that you change in an experiment. It is the variable you control. It is called independent because its value does not depend on and is not affected by the state of any other variable in the experiment. Sometimes you may hear this variable called the "controlled variable" because it is the one that is changed. Do not confuse it with a "control variable," which is a variable that is purposely held constant so that it can't affect the outcome of the experiment. The dependent variable is the condition that you measure in an experiment. You are assessing how it responds to a change in the independent variable, so you can think of it as depending on the independent variable. Sometimes the dependent variable is called the "responding variable." 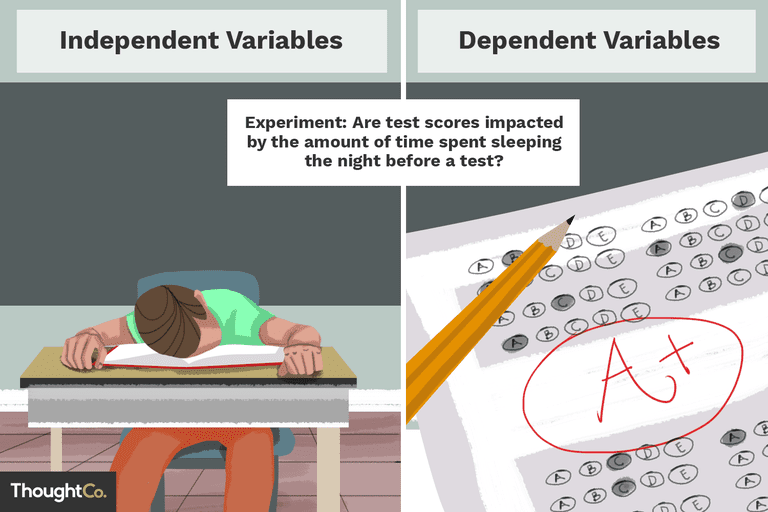 In a study to determine whether how long a student sleeps affects test scores, the independent variable is length of time spent sleeping while the dependent variable is the test score. You want to compare brands of paper towels, to see which holds the most liquid. The independent variable in your experiment would be the brand of paper towel. The dependent variable would be the amount of liquid absorbed by a paper towel. In an experiment to determine how far people can see into the infrared part of the spectrum, the wavelength of light is the independent variable and whether the light is observed (the response) is the dependent variable. If you want to know whether caffeine affects your appetite, the presence/absence of amount of caffeine would be the independent variable. How hungry you are would be the dependent variable. You want to determine whether a chemical is essential for rat nutrition, so you design an experiment. The presence/absence of the chemical is the independent variable. The health of the rat (whether it lives and can reproduce) is the dependent variable. If you determine the substance is necessary for proper nutrition, a follow-up experiment would be to determine how much of the chemical is needed. Here, the amount of chemical would be the independent variable and the rat health would be the dependent variable. If you are having a hard time identifying which variable is the independent variable and which is the dependent variable, remember the dependent variable is the one affected by a change in the independent variable. If you write out the variables in a sentence that shows cause and effect, the independent variable causes the effect on the dependent variable. If you have the variables in the wrong order, the sentence won't make sense. Independent variable causes an effect on the dependent variable. Example: How long you sleep (independent variable) affects your your test score (dependent variable). Example: Your test score affects how long you sleep. This doesn't really make sense (unless you can't sleep because you are worried you failed a test, but that would be a whole other experiment). Test your understanding with the scientific method quiz.